which was published in 2003. I also discovered a patent (US7512602) which describes the same idea but was patented only in 2009. The patent contains the same figures as the research paper. How can the published research paper from 2003 not be considered (or listed in the patent) as prior art to this patent? If the paper was published after May 30 2003, the patent application preceded it. The relevant date is not the day the patent is issued, but the day it was applied for. In this case that was in 2006. But it is a continuation of an application filed in May 30 2003. 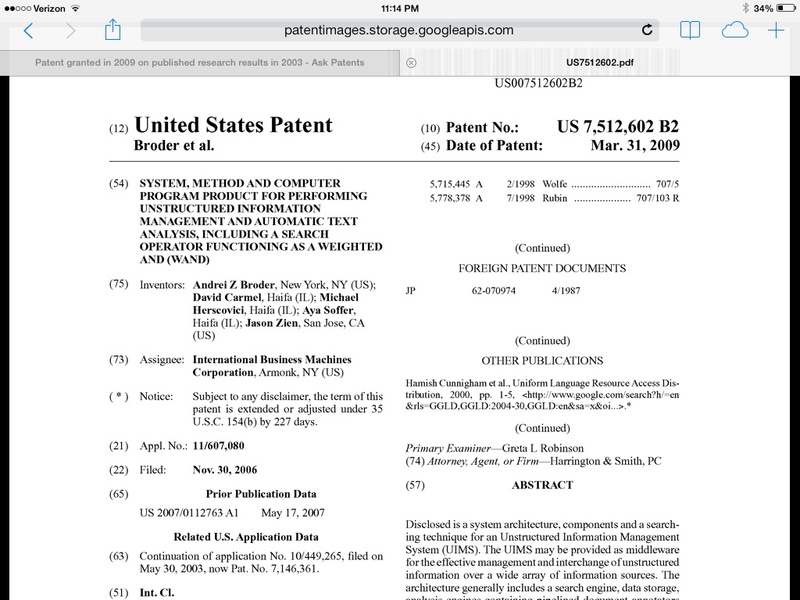 That information appears on the face of the patent under the heading "Related U.S. Application Data". If a patent is filed the day before a journal article is published, that article is not eligible to be considered prior art. It's not prior. Not the answer you're looking for? Browse other questions tagged prior-art research us7512602 or ask your own question. Does my past work qualify as prior art for US20140272267?